This fall has been a bit unpredictable, but the one thing I've known for sure is that I wanted to get my little decorator hands on my Aunt Jean's farmhouse. My folks had visited my aunt in August and casually mentioned that she seemed ready for a change in her living room. After seeing photos of the space, I immediately started planning the update. Then my mother patiently reminded me that I needed to contact my aunt and make sure she was up for the journey. Ah yes. Contact made and she was on board! 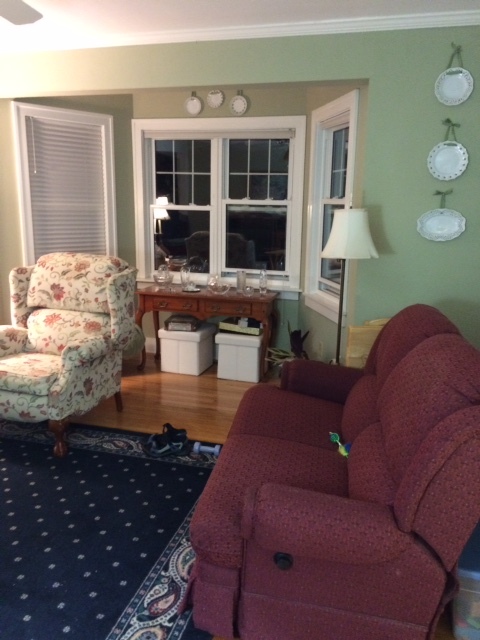 For about a month, my aunt and I corresponded about her living room makeover. Her likes and dislikes, how she uses the room, what she wanted to keep, budget, etc. All of this helped me to compile a mood board, floor plan, and purchase list before I even set foot into the space. I knew I was visiting the first of November, so I made sure to order some of the larger items so we could have them on site while I was there. Then I planned on shopping once I saw what was needed to fill in the gaps...art, lamps, accessories. BUT, once I arrived it became clear that my aunt had almost all the accessories we needed to make the space feel like home....I just had to find them. In the farmhouse. As in all the closets, attics, basement, and barns. She had treasures everywhere! I just 'shopped' in her home. Now granted there were a few things we had to buy, but all in all everything we used to decorate was hers. What fun for my aunt to see these items she had tucked away be given new life. You've seen the befores, now onto the after photos. Fun, right! The transformation is pretty amazing. I purchased the rug, but she had this amazing trunk. And the red couch gained new life when we moved it into the conversation area and added a few pillows! Here is the other angle. Which hopefully helps relate to the befores more clearly. My favorite transformation to the room was the TV wall. Here it is before I got my little hands on it. 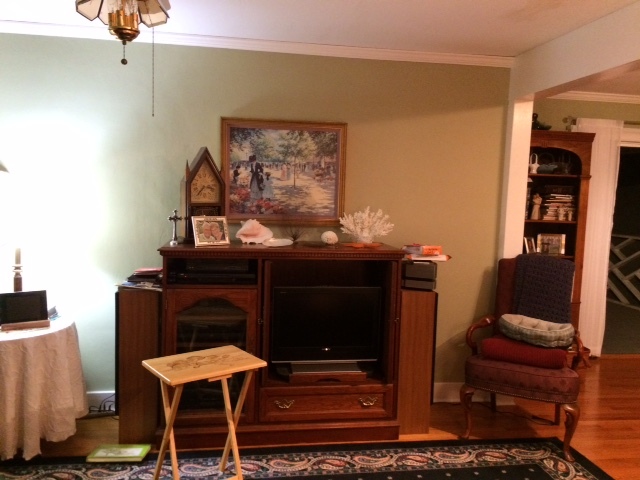 I purchased the TV stand and we upgraded the TV, but the Bentwood chairs were hers (tucked away in the barn attic)!!! Some of the art was collected from her travels around the world and we pulled most of the treasures below the TV from around the house. AH!! So many stories to tell about these pieces, but all in all I am SO thankful we were able to display them in ways that evoke fond memories for my aunt. As a note...we plan to add sconces where the white pieces of paper are located. That side of the room needed some light and this was the best (most beautiful) way! The other side of the room (where the pink sofa used to be and please excuse the exercise ball) is still waiting for the finishing touches. We will most likely order a comfy chair for that corner by the round table and then some sort of ottoman (maybe :). We also plan to swap the track lighting for a pendant over the rug. My aunt has a large family (8 kids) so when she hosts it can get a little full. The new configuration allows for two conversation areas during those times. I'm excited for her. Here is looking towards the fireplace. The fireplace doesn't work and is off center, so we didn't feel it completely necessary to center things on that focal point. And here is looking towards her porch. Goodbye pink couch! The blue tape on the floor indicates where one of the comfy chair legs will go. And on the wall by the kitchen we plan to hang this communion rail gate to hide the vent but still allow for air flow. It's from my aunt's church. Beautiful right! Again with the stories. So many in this room now. And here is my lovely Aunt Jean. She is the best! She's loving, hard-working, kind, joyful, giving, thoughtful, laughs at all my humor, and sparkles with life. Thank you Aunt Jean for letting me into your life this past week. It was my joy.